Cupcakes 'n Daisies: Roundabout, Madeline, and Flora . . . . . . . I've had the best week in my sewing room in ages and made progress on both my projects. I kind of like having two projects going, which shocks my socks off!! I've made and trimmed all the pieces and assembled 3 blocks for Roundabout. Same for Even Bigger Madeline, all the pieces are done, I'm just making the blocks. So far I've not made a block that I don't love, I'm swooning over that Rouenneries fabric! 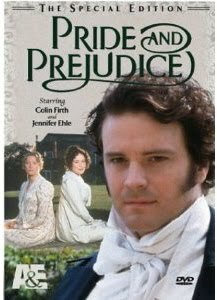 Even though the fabric has a French influence, it got me in the mood to watch Pride and Prejudice, not the new one, with Keira Knightley . . . .
the old A&E one, with Colin Firth. I love the language...... "Mr. Bennett, how can you vex me so?" For some reason, watching that movie and working with that Rouenneries fabric just feels like the perfect match. on the top shelf . . . . I've started trimming and saving my selvages. Do you visit The Selvage Blog? Karen posts pictures almost daily of the most amazing things that folks make from their selvages. Not just really cool quilts but things like bowls, bags, and my all time favorite a chair!! I'm not sure if I'll ever make anything, but there's no sense in wasting them, I would hate to run across something I really want to make but have no selvages to use. 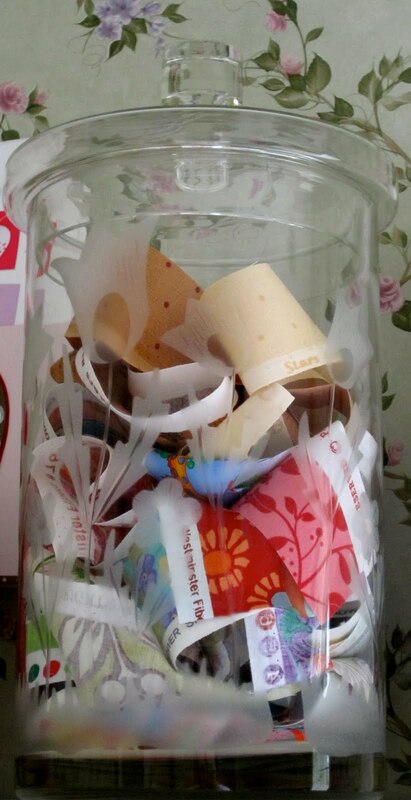 I cut the selvages off as I go, and throw them in this jar. This jar was a wedding present from Thelma and Charlie Green. It's one of our few wedding presents that have survived 33 years of marriage and 14 moves. 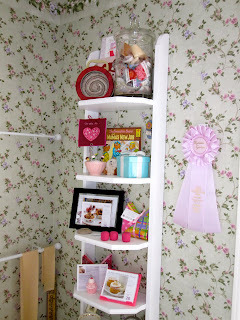 I use them all the time, not just in my sewing room, they come in handy all over the house. They come in L, XL, and XXL and I use them all. I'm using this one to store my Glace backing. I was lucky enough to receive some lovely flowers for Mothers Day. I've enjoyed them all week. or the blooms would open wider. Maybe that's why I had such a good week, maybe I work best when fresh flowers are around the house! so I put it in this little glass bowl and put it on my nightstand. It probably got more attention being in this little bowl than it would have in the arrangement, so it was kind of like getting two arrangements from the one. I'm one lucky Mama and I know it!! I love the older version of Pride and Prejudice! I have to watch it at least once a year. I too have been saving my selvages. One day I might have enough to make some little project. Have a great week! Love the older version too. One never tires of rewatching the old classics. Just visited "The Selvage Blog" today, and then remembered the scraps I put out on Friday. Oh well, I will start saving from now on. 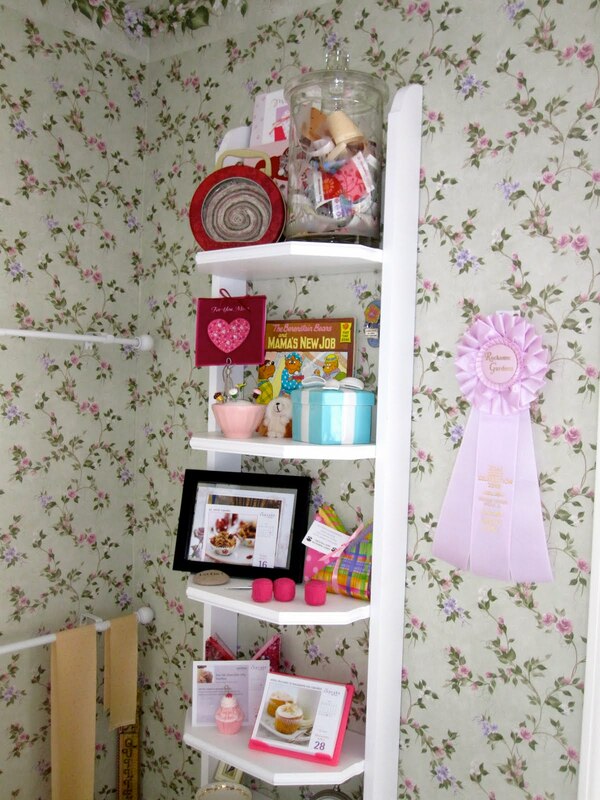 The jar of selvages looks sweet upon your shelf - you'll find a must do project one day soon. I'm so glad you are having fun working with multiple projects at once! Welcome to my world LOL. I started saving my salvages about 6 months ago after seeing all of the "Red Zinger" projects out there from the Selvage blog. I think that's what I'm going to make with them, but who knows! Your flowers are gorgeous. What motivation. I love hearing you had such a progressive and happy week, and I can't wait to see pics of your projects. PS. Way to go with the whole working on more than one project at a time. It's not so bad, is it? When you save selvages is there a width to cut them that works best for most projects? I know you need some of the fabric, but I am never sure how much. I accidently came across your blog and immediately spotted MR Darcy. Ahhh, the lake scene! Did you ever watch : "lost in Austen"? I use ziploc bags like crazy around here. 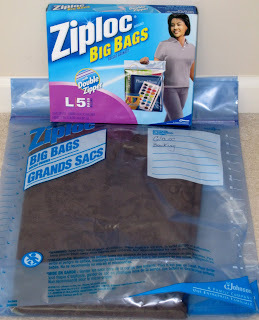 The super large ones are my project bags and kept together in a drawer. So easy to scrumble through them and not make a mess. Your flowers are so beautiful. I especially love the little sweetheart rose. What a day brightener. I feel guilty everytime I throw away a selvedge edge, but I know I can't do every project I want! There just aren't enough hours, are there? I can't wait to see your projects! I love the Selvage Blog ... so inspirational. I think your selvages are adorable in the jar. I think it was through your blog that I discovered the Selvage Blog a while ago, and I started saving my selvages in a large glass snifter. I can't wait to make something out of them. Lovely flowers there Thelma. So glad you enjoyed Mother's Day!! Great progress on your projects. Love the selvage jar. I have a special place I keep mine as well. If you need some more selvages, Thelma, send me your mailing address to suscleve@aol.com and I'll send you a bag full. I started collecting them a year so so ago, and I have never made one thing from them. Friends found out I was collecting them and started giving me theirs. I have several boxes full. 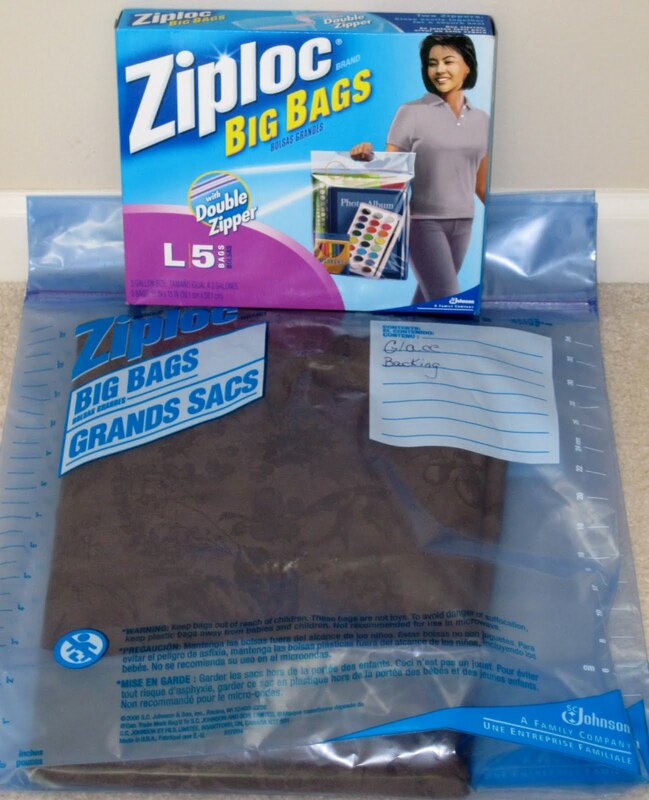 you are so stinkin' organized and everything you do is so doggone classy - my selvages (which will probably NEVER be ANYthing)hang out in a ziploc bag, not a beautiful crystal clear jar ... oh Miss Thelma, how can you vex me so?